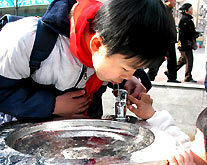 Clean drinking water is the Chinese public's No.1 environmental concern, according to a state survey released yesterday. The survey was conducted in April and May by the All-China Environmental Federation (ACEF) and supervised by the State Environmental Protection Administration (SEPA). More than 4 million people from 31 provinces, autonomous regions, municipalities and special administrative regions took part in the survey, airing their views on China's environmental issues through the Internet, text messages and mailed-in questionnaires. "It is an unprecedentedly wide survey of environmental issues among the Chinese," said Wang Dongqing, vice-secretary of ACEF. "The results will be sent to related departments as an important reference for drafting of the 11th Five-Year Plan (2006-10) on the country's environment," Wang added. According to the survey, after drinking water pollution, the public were most concerned about air quality, domestic rubbish, the disposal of industrial waste, the destruction of vegetation and desertification, a shortage of water resources, and noise and car pollution. More than 96 percent of the people surveyed said China is challenged by a water shortage crisis and that nurturing a water-saving society is the most effective way to solving the problem. The public also called for the Yellow River to be the focus of water pollution prevention efforts. As for domestic rubbish, 77 percent of participants supported the idea of not providing plastic bags in supermarkets, although 22 percent said it was a bother to bring a bag with them when shopping. Securing a comfortable majority, 73 percent of participants said residents should collect and sort their waste by material for recycling. According to the survey, 97 percent of participants said the government should listen to the public when making decisions on environmental planning. Both the public and experts in the investigation strongly held that the government should increase input into environmental protection during the 11th Five-Year Plan (2006-10) to at least 1.5 percent of the gross domestic product (GDP). Some experts even suggested raising it to 2 percent with the country's vast rural areas getting more support in appropriations and policies from the government. In 2004, the country's input to environmental protection was 1.3 percent of the GDP. Most people surveyed also suggested that other ways of pooling money in line with market mechanisms towards the cause of environmental protection should be introduced, especially in the construction of sewage and waste treatment facilities in cities. The survey also showed 98 percent support for the levying of special taxes to help boost environmental protection. As for the most effective way to protect the environment, 71 percent of the survey said new laws were the answer, with 56 percent of the experts surveyed complaining that current law enforcement was not powerful enough and legislation in certain areas lacking. Environmental protection should be one of the indices by which government officials' achievements are evaluated, according to 97 percent of those surveyed. "The survey provides some precious information from the public for our future work," said Wang Yuqing, a vice-minister of SEPA. "For example, the public think we should put our focus on improving water resources and air quality. This is in line with the official point of view."